In need of some woodwork? Chances are you’ll want to hire a Montrose, AL carpenter. Carpenters work with all types of wood and can specialize in many different areas, including framing, finishing and custom-made furniture. Make sure you choose the right Montrose carpenter for your job by asking plenty of questions, viewing their past work and reading reviews. 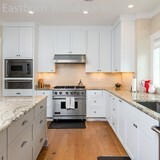 Eastburn Woodworks is a family ran and owned business providing home owners with custom built cabinets to bring their dream spaces to life. Kenneth Eastburn, our founder, has over 30 years of experience in woodworking. He started Southern Builders which later became Eastburn Woodworks back in 1997. Kenneth meets with the home owner and designer to make sure everything is just how they want and works diligently with the builders to bring everything to life. "I always enjoyed making things with wood and reading books about woodworking. Eventually, I bought out a cabinet shop from someone who needed to move. I self-studied Autocad and CabinetVision and go to many woodworking shows and seminars to be aware of all the newest technology available. While new technology is good, I still remain true to quality craftmanship." - Kenneth Eastburn Our furniture quality cabinets are hand built per order to your specifications and details. Eastburn Woodworks employs many quality woodworkers and painters, some of whom have been with the company from the start. We are constantly improving our work by training with a professional finisher not only at his facility but here in our shop as well. This professional trains our finishers on new techniques and helps us develop new finishes. solid wood doors , molding , windows , interior trim , and more. Tingle Woodworking has been providing quality home repairs, renovations, and custom cabinetry in Mobile and Baldwin Counties for many years. I understand that finding the right person to work in your home can be daunting. I will work closely with you on your project from design to completion to assure that your project is exactly what you want. My name is Clayton Green, We do new home construction and remodeling. We also do custom staircases, mantels, and closets. We are Abel Construction Services L.L.C. Northwest Florida's premier Cabinetry and Construction Specialist. We can handle all types of construction here at Abel. From Residential Construction to Commercial Construction ; Renovations to Additions, No job is to big for us to handle here at Abel Construction. We are also a licensed Legacy Cabinets dealer so we can sell and install your kitchen cabinets for you. We are located in Pensacola Florida but we service all of Northwest Florida as well as Alabama . over and above construction co.